The first day of April is always a traditional time for pranks and puns, and astronomers and scientists aren’t above an April Fools’ Day shenanigan or two. Hey, I gotta admit, as a freelance science journalist, even my radar will be up tomorrow as I’m sure that someone will try to slide some wowzers by the credulous media, as they always have in the past. If the aliens wanted to conquer the Earth it’s wide open to ‘em on April 1st, I’m just sayin’. Who would believe the tweets were for real, as they landed ray guns ablaze on the White House lawn? Trust us; you won’t see such April Fools’ hi-jinks from Universe Today. If you read it here, the alien invasion is for real, and you can begin stockpiling food and ammo appropriately in the best tradition of Falling Skies. In 1974, John Gribbin published The Jupiter Effect, claiming that a Grand Alignment of the planets would spell doomsday for the Earth on March 10th, 1982. On April 1st 1976, Astronomer Sir Patrick Moore made an announcement along a similar vein to BBC listeners. A rare conjunction of the planets Pluto (which was still classified as a planet at the time) & Jupiter would weaken the gravitational field of the Earth at precisely 9:47AM. This would cause the law of gravity to become temporarily suspended, and cause things to fly about. Big hint: Pluto was nowhere near the gas giant at the time. Not that it would matter or have any consequence for the Earth! Although the hoax was quickly revealed, that didn’t stop several listeners from calling in and reporting observed results from the fake Jovian-Plutonian Gravitational effect! The first star party? 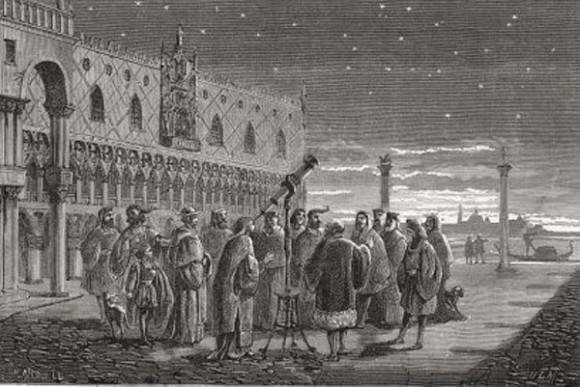 Galileo shows off the sky in Saint Mark’s square in Venice. Note the lack of adaptive optics. (Illustration in the Public Domain). Many questionable astrophysical papers have been spotted in the wild trying to sneak past the guardians-that-be over the years on & around April 1st. On April Fools’ past, we’ve learned that Schrödinger’s Cat is not alone, the supposed discovery of the “bigon” particle, and that the “non-detection of the tooth fairy” has been reported. Hey, never let it be said that science geeks lack a sense of humor. What’s especially amazing is when one of these tall tales actually makes it past the credulous media and into print! One of our favorites hit the servers last year on March 30th just in time to gain traction for April Fools’ Day with the cryptic title On the influence of the Illuminati in astronomical adaptive optics. OK, I’ll admit we didn’t question the veracity of the claim for oh, like, maybe a tenth of a second. For those without enlightenment into the world of Woo, the Illuminati are purported to be the shadow cult organization going back to the Middle Ages that’s supposed to be behind, well, every nefarious plot in modern society. “They put the eye over the pyramid on the back of a dollar bill, man…” as some true believers will claim. And while they didn’t have adaptive optics technology way back in Galileo’s time, the mock study does assert a tenuous link between the Illuminati and the “astronomical rise” of Brittany Spears and Lady Gaga. Phobos (above) and Deimos (bottom) close up; no Martian construction projects noted. (Credit: NASA). Are Martians secretly hollowing out a base on the Moons of Barsoom? The Moons of Mars were also the setting for an April Fools’ prank in 1959. The Martian moons are bizarre in their own right. 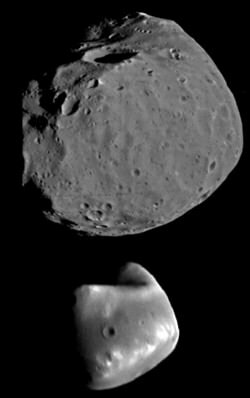 Orbiting at 6,000 & 20,060 kilometres above the surface of the Red Planet, Phobos & Deimos are almost certainly captured asteroids. In fact, Phobos orbits its primary closer than any other moon in the solar system. Phobos will crash into Mars millions of years in the future. The hoax was perpetrated when Walter Scott Houston, posing as Dr. Arthur Hayall of the fictitious University of the Sierras made a claim in the Great Plains Observer that Phobos & Deimos were in fact artificial satellites. Though the joke ran its course, the idea has cropped up in fringe circles over the years. Russian scientist Iosif Shklovsky made a similar allusion years later, asserting that the low density of Phobos indicated that was hollow (!) Mariner 9 returned the first close-up views of Phobos in 1971, showing a decidedly asteroid-looking appearance. Of course, this hasn’t stopped the likes of folks like Richard Hoagland (he of the face on Mars) from resurrecting the outlandish claim, all of which started as a practical joke. And of course, with the advent of the Internet, you don’t have to wait until April 1st to receive modern day hoax emails proclaiming “MARS WILL APPEAR AS BIG AS THE FULL MOON!! !” which now apparently happens every August. A moon for Mercury… (or not!) (Credit: NASA/Johns Hopkins University/APL/Carnegie Institution of Washington). Spurious moons are apparently the “low-hanging fruit” of astronomical April Fools’ pranks. In 2012, an image of a purported moon of the planet Mercury’s as discovered by the MESSENGER spacecraft appeared in the JPL Photojournal. The captioning declared the moon had been named Caduceus and was 70 metres in diameter. Perhaps such a prank is appealing because there’s nothing immediately outlandish about the idea. New moons get discovered periodically on first reconnaissance missions past planets. For a brief time in 1974, Mariner 10 project scientists did indeed think they had discovered a Mercurial moon. Reading on through the press release, however, revealed that a collision course of MESSENGER with the moon was set to cause it to “arrive at Earth by 2014.” The “moon” also bared a suspicious resemblance to the asteroid 243 Ida as seen by the Jupiter-bound Galileo spacecraft in 1993. Some April Fools’ hoaxes have presented ideas that have actually gained scientific traction in reality over the years. On March 31st, 2005, NASA’s Astronomy Picture of the Day website contained the teaser “Water on Mars!” for its next presentation to follow on the next day. A flurry of discussion followed; was there a discovery from the Spirit & Opportunity rovers forthcoming? We should’ve checked the calendar first. The next day, APOD featured water… in a glass, sitting atop a Mars bar. What’s ironic is that recent announcements from the Mars Science Laboratory support the idea of ancient water on the Red Planet, so the MSL may well have had the last laugh. Sulfate-rich sandstone imaged by Opportunity (left) and Curiosity (right). Both hint at ancient surface water on Mars. (Credit: NASA/JPL-Caltech/Cornell/MSSS). The Museum of Hoaxes also hosts a list of astronomy & space-themed April Fools’ Day pranks that have been perpetrated over the years. From a Soviet space capsule landing outside of Kankakee, Illinois to life discovered on Jupiter in 1996, it’s all enshrined for the curious. One of our faves is Google’s 2004 announcement that they were accepting applications at a new research center… based on the Moon in Copernicus crater. The ability to survive “with limited access to such modern conveniences as soy low-fat lattes,” was cited as a prerequisite, but a sushi chef and two massage therapists would be on site. At least the assignment wouldn’t be totally austere! Closeup of Copernicus crater region… note the distinct lack of soy lattes! (Photo by author). Wait, *Deimos* is going to spiral into Mars? I thought only Phobos was the only one slated to die, due to being closer than geostationary … er, arestationary? … orbit. Deimos is not that close. Great catch; did some quick research, and the consensus is that Deimos is actually receding from Mars, just like our own Moon. Please remember all, …’please’. Daily “HUMOR” among colleagues at work either side by side, online, & any where out there. Apply humor daily. Humor always makes very serious work so much less tense. We respected ‘humor’ by setting aside 1 day out the year for it. Daily humor must be applied. Take care all. Previous PostPrevious ‘Alien Spaceship’ looking Dragon set for Unveiling by SpaceX this Year!